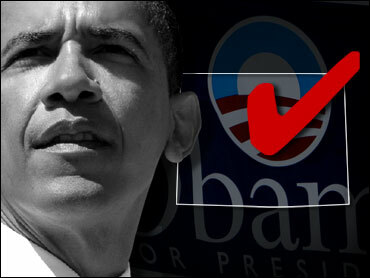 Sen. Barack Obama has won the Wyoming Democratic caucuses. CBS News estimates that Obama captured seven delegates in the state. Clinton captured five. The Wyoming contest was the latest in the candidates' close, hard-fought battle for the party's presidential nomination. Obama generally has outperformed Clinton in caucuses, which reward organization and voter passion more than do primaries. The Illinois senator had already won 12 caucuses to Clinton's three. "This is one more caucus victory for Obama, whose campaign has amassed a delegate lead based partly on a strategy of focusing on events like this," said CBSNews.com Senior Political Editor Vaughn Ververs. "This win, coupled with a likely victory in the Mississippi primary on Tuesday, could wipe out Clinton's gains from last week. But her campaign will go on, focused on Pennsylvania's April 22nd contest." Clinton threw some effort into Wyoming, perhaps hoping for an upset that would yield few delegates but considerable buzz and momentum. The New York senator campaigned Friday in Cheyenne and Casper. Former President Clinton and their daughter, Chelsea, also campaigned this week in the sprawling and lightly populated state. Obama campaigned in Casper and Laramie on Friday, but spent part of his time dealing with the fallout from an aide's harsh words about Clinton and suggestions that Obama wouldn't move as quickly to withdraw U.S. forces from Iraq if elected. In Casper, Obama said Clinton had no standing to challenge his position on the war because she had voted to authorize it in 2002. Clinton, buoyed by big wins in Ohio and Texas last Tuesday, said she faced an uphill fight in Wyoming. Her campaign also holds out little hope for Tuesday's primary in Mississippi, which has a large black population. Obama's campaign credited the candidate's message for the win. "Especially in the intermountain West, people are hungry for something different, people are hungry for someone who's a uniter, who can bring together a coalition of change," said Gabe Cohen, Obama's state director in Wyoming. Clinton's campaign took heart in their ability to pick up more delegates. "We knew that Wyoming was an uphill climb and that Senator Obama was expected to win," said Ben Kobren, a spokesman for Clinton's campaign in Wyoming. "We're glad we were able to bring out our grassroots support and come very close in delegates." Both candidates were looking ahead to the bigger prize - delegate-rich Pennsylvania. In Wyoming, 12 national convention delegates were at stake. From the first caucuses of the day, it became clear the state's Democrats were showing up in large numbers. In 2004, a mere 675 people statewide took part in the caucuses. In Sweetwater County, more than 500 people crowded into a high school auditorium and another 500 were lined up to get inside. "I'm worried about where we're going to put them all. But I guess everybody's got the same problem," said Joyce Corcoran, a local party official. "So far we're OK. But man, they keep coming." Party officials were struggling with how to handle the overflow crowds. The start of the Converse County caucus was delayed due to long lines. In Cheyenne, scores of late arrivers were turned away when party officials stopped allowing people to get in line at 11 a.m. EST. A party worker stood at the end of the line with a sign reading, "End of the line. Caucus rules require the voter registration process to be closed at this time." State party spokesman Bill Luckett said they were obligated to follow its rules as well as those of the Democratic National Committee regarding caucus procedures. "Everybody knew the registration began over an hour before the caucus was called to order. We've done everything we could to accommodate people in the long lines," Luckett said. After initially accepting provisional ballots from about 20 people who remained behind at the caucus site, party officials said they and both campaigns had decided not to count those votes. John Millin, state party chair, said doing so would have been unfair to those who had left after being turned away. In Casper, home of the state party's headquarters, hundreds were lined up at the site of the Natrona County caucus. The location was a hotel meeting room with a capacity of 500. Some 7,700 registered Democrats live in the county. "We'll have to put 'em in the grass after a while," said Bob Warburton, a local party official. About 59,000 registered Democrats are eligible to participate in Wyoming's caucuses. Only in the last few weeks have the campaigns stepped up their presence in Wyoming, opening offices and calling voters and sending mailers. Although a win in Wyoming may not persuade many superdelegates, it marks one more prize for Obama as he makes his case for the nomination. Clinton has hinted recently that if she wins the nomination she would consider sharing the ticket with Obama. But in an interview Friday in Wyoming with KTVQ-TV, a CBS affiliate based in Billings, Mont., Obama shied away from that possibility. "Well, you know, I think it's premature. You won't see me as a vice presidential candidate - you know, I'm running for president," Obama told the television station. "We have won twice as many states as Senator Clinton, and have a higher popular vote, and I think we can maintain our delegate count."